Come in today to have your air conditioner serviced. When the temperature rises in the summer, a vehicle’s air conditioning system is vital for a comfortable drive. Unfortunately, with many components working together, a small problem can quickly turn into a much bigger one. A vehicle’s A/C system is divided into two sides, known as the high side and low side. It consists of five main parts: a compressor, condenser, receiver-drier, expansion valve, and evaporator. The compressor, beginning at the high side, works as a pump to move refrigerant through the system. The expansion valve begins at the low side, and restricts refrigerant flow to lower the pressure and the temperature of the refrigerant. 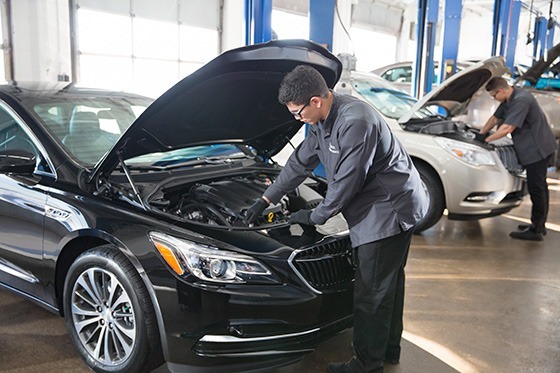 Unlike other parts of a vehicle, an air conditioner can malfunction for a variety of reasons, making it difficult to pinpoint the problem without a closer inspection of all parts. Weak air flow can be caused by mold or bacteria buildup in the evaporator, a loose hose, a damaged or broken fan, or even a small broken seal. A clogged or loose tube/hose. A vacuum or Freon leak. Diminished air flow caused by a broken seal. Damaged or failed compressor, compressor clutch, condenser, blower motor, or evaporator.